Works in 32bit and 64bit mode. Fixed crash when stopping and restarting composition. The USB driver is still dropping a lot of frames (so the effective framerate is about half what it could be). Doesn't handle multiple Kinects simultaneously. 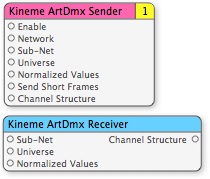 ArtDmx Sender Patch --- Broadcasts a structure of DMX values to the specified IP Network, Sub-Net, and Universe. ArtDmx Receiver Patch --- Receives broadcast DMX values from the specified Sub-Net and Universe. 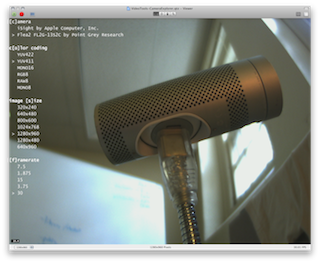 Provides QuickTime-free live Firewire video capture, using libdc1394 2.x. Supports any IIDC/DCAM-compliant Firewire camera. Cameras only support certain combinations of Color Coding, Resolution, and Framerate. Watch the Error output and Console log when troubleshooting. Fixed issue with GL Stereo Environment flickering on Mac OS X 10.6. Added new GL Structure Renderer patch --- renders its subpatches multiple times, once for each element in the provided structure, after applying the specified transformation. Thanks to @toneburst, @gtoledo3, and @cybero for help sorting this out. New Stereo Environment patch, which renders its child patches twice using an asymmetric projection frustum, once for the right eye, once for the left eye, and provides each as an image output. New Look At patch (a two-point camera). New Camera patch (a one-point camera). Added "Image Structure" input to the GL Quad Structure patch. Fixed GL Inverse Rotation so that it executes every frame (rather than only once). Fixed SuperGLSLGrid so that color uniform values are properly set in 64bit mode. Separated the Alpha blendmode override to a separate plugin, so that GLTools itself doesn't perform any runtime hackery (and is thus somewhat less risky). This plugin adds an "Alpha" option to the Blending menu of most Consumer patches. 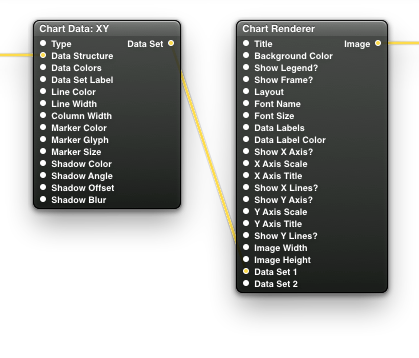 Useful to draw nice antialiased GL Lines, for example.